Aerial view of a high-rise office building. Photographer's stamp visible through tissue on verso: Art James. One interior view showing a board room through a closed door. Exterior and aerial views of an office and retail building. Construction lasted from 1981-1985. Contact sheet with four black and white images of the Temple building in Toronto, originally constructed in 1896. The building was Toronto's first skyscraper. Corresponding negatives: 2009.002.2393. Photographs of the interior and exterior of a high-rise office building with large central atrium, first phase of a four building complex. Photograph of the interior of a restaurant located on the ground floor of an office building in downtown Toronto. A stamp on the back of the photograph gives the architects as Baron Myers Associates. Exterior views, showing main entrance. Folder contains 2 b&w photographs of the Atlas Steels Ltd. 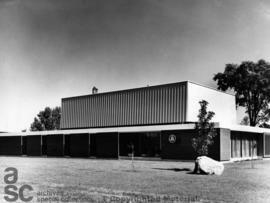 Administrative office in Welland, Ontario. Both photographs show the exterior of the low-rise office building. Item is an illustrated brochure detailing Kodak's office design philosophy and practices. Exterior view of a mid-rise concrete office building, and interior views of lobby, atrium, cubicles and hallways. Photograph of a glassfront office at street level, exterior and interior views. Some with architects at drafting tables. Photographer's stamp on verso: "Fiona Spalding Smith". Interior views of the offices of Chiat/Day advertising firm. 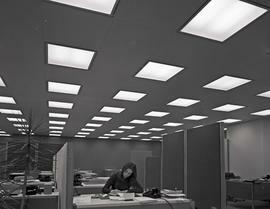 Photograph of an illustration for the Nacan Products office & laboratory by Allan Levine, Architect.